A month ago I received the postcard with a list of community events from the City of El Cerrrito. I immediately entered the information of animals ordinance meeting on my media device. To me, this is a no brainer. Why would anyone argue with having a few chickens and bees? Sure there might be some noise from the chickens, but there are noise from cars, people, dogs, etc. We learned to live with some noise as a part of life. 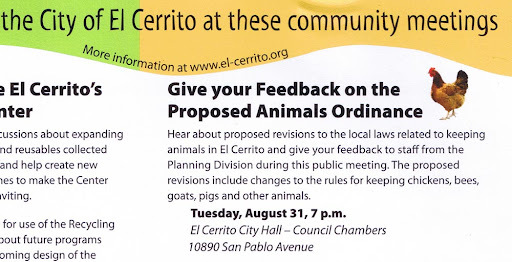 My family has lived in El Cerrito for almost 3 decades, but nobody has ever attended a community meeting. I think they rebuilt the city hall several years ago, and this was my first time seeing it and stepped inside. There was a lot of tension in the room that I sensed immediately. The opponents were aggressive, and combative on their stand. One of their main argument is that farm animals have no place in urban/suburb areas. Many people of course are fearful of bees. I would be if I didn't learn from Master Ken. I saw the main issue as being fear, responsibility, and education. The opponents are fearful for bees, possible diseases, and irresponsible animal owners. Many city folks are not familiar with bees and animals other than dogs and cats. One proponent for the new ordinance was an older man sitting right in front of me. At the beginning, it was hard to tell which side he was on. He had a cowboyish hat on, black leather vest and jacket, western belt buckle and jeans. He started out saying that he's been living in El Cerrito since 1952 and asked one of the young city employees how long she's been living in El Cerrito. We were all a little unsure where this was going, but she answered appropriately. It turned out he is quite an animal friend who used to have a little urban farm in his backyard. The current animal ordinance does not allow any animal other than dogs, cats, birds weighing less than one-half pound; and any other animal weighing less than three pounds. So, if you have a 5-pound pet bunny, you are actually breaking the city animal ordinance. I am not sure how heavy Dusty is. The proposed ordinance would allow people to have a limited number of chickens, goats, pigs, and bees legally as long as people follow all the regulations and obtain the proper permit(s). The permits however range from $50 to over $1000 depending on what kind of permit(s) you need for the particular animal(s) you want to keep. There are people currently keeping all these animals. Will they go and apply the permits if the new ordinance is approved? I highly doubt it. $1000 is not pocket change. I think people will just continue doing what they have been doing. The complainers will keep complaining. Life will go on as usual. I remember Master Ken once said, "If you think you can do it, just DO IT. If you sit around and wait for someone to give you permission, it may never get done." As any new movement, there are going to be people oppose of changes. It's not likely for me to have more animals at this time simply because I don't think I have the time and energy to take care of them; however, if my neighbors decided to keep them, I would be delighted. I would volunteer to help out and get some fresh eggs or honey in return. I have a good relationship with my adjacent neighbors, but I know some people no longer talk to neighbors in this modern time unless there is inconvenience caused by their neighbors.